Although just about everyone uses the term “core,” most are unaware that the term was coined in 1982 to describe the muscles of the center of the body.1 So, contrary to popular misconception, your core isn’t just your abs and lower back; the core is your entire torso. In other words, your core is made up of all of the muscles that make up your torso: your glutes, lower back, mid-back, lats, shoulders, pecs, serratus, abs and obliques. That means, if you want a strong core, you’ve got to strengthen each aspect of your torso. Now, since your upper body pushing day is already giving you plenty of work on your pecs and shoulders, and since your upper body pulling day is already giving you plenty of work on lats and mid-back musculature, the focus here is to help you maximize the strength of your abdominals, obliques and low-back muscles. Learn how to use the Core 4 training formula in order to make sure you’ve got a core that’s strong in all directions. Put simply, in order to have a fully comprehensive core training routine, it must hit each of four aspects described above, as doing so covers each of the major movements your torso performs, as well as all of the muscle that make those movements possible. The exercises included in the program aren’t just arbitrary, they’re founded in the research investigating the maximizing of core muscle activation. In order to make sure you hit each aspect of your core, you’ll include at least one exercise from each of the four categories of the Core 4. To help you understand which exercise fits into each category, the following chart provides a list of my top three exercise choices that fit into each category, along with general set and rep recommendations for each movement. Out of the 12 exercises provided on the above list, squats, Romanian deadlifts, good mornings, ab wheel rollouts and side elbows planks are basic, foundational exercises that you’re surely already familiar with. So, there’s no need to describe how to do those in detail. However, since you may not be familiar with the seven other exercises on the list— as they’re not so basic moves— the following are detailed descriptions for each exercise in order to make sure you know how to perform them safety and effectively. Lie down with a fitness ball in the arch of your lower back and hold a weight-plate directly above your chest with your arms outstretched. Perform a crunch, reaching the weight-plate toward the sky. Slowly reverse the motion, allowing your abdominal muscles to stretch over the ball. When performing this exercise, be sure that the ball does not roll at any point. Also, do not sit all the way up so that your torso is perpendicular to the floor, because this takes the tension off your abs. This exercise combines the ball pike in the ball rollout into one comprehensive abdominal exercise. Hold yourself in a push-up position with your feet on a Swiss ball that’s between 55 and 65 centimeters in size (to make the exercise easier, move the Swiss ball toward your belly button). With your body in a plank position, keep your legs straight and push your hips toward the ceiling while keeping your back flat. After straightening your hips and coming back to the start position, push your body backward on the ball until your arms are fully extended in front of you and your legs are fully extended behind you. Reverse the motion and repeat. With your feet hip-width apart, hold a fairly heavy dumbbell on one side of your body at your hip (or at your shoulder) with your palm facing your body. Walk up and down the room, keeping the dumbbell in this position while maintaining a strong upright posture. Then switch hands and repeat by holding the dumbbell on the other side. Place one end of a barbell in a corner or into a Sorinex LandMine device and hold the other end of the barbell with both hands while you stand tall with your feet roughly shoulder-width apart. Move the barbell from side to side in a rainbow-like arc from one shoulder level to another without allowing any rotation at your torso and maintain a straight spine. As you move the barbell from side to side, your torso should always remain facing the end of the barbell that is anchored. Stand with your feet shoulder-width apart with the handles of a resistance band or cable on your right side at shoulder level. Hold the handle on your right side with your elbows slightly bent and pull the handles across your body to the left until both arms are just outside your left shoulder. Move your arms horizontally in the opposite direction (toward the origin of the cable) until they reach just outside your right shoulder. The range of motion in this exercise is small, roughly the same as the width of your shoulders. Be sure that you remain tall and do not allow your hips to rotate— they should remain perpendicular to origin of the band/cable. 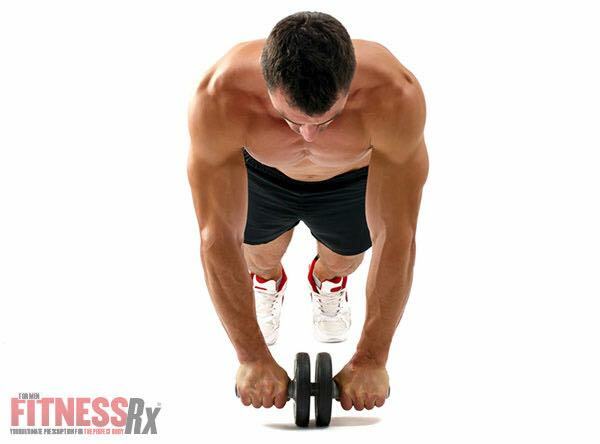 In a push-up position with your feet shoulder-width apart, hold a dumbbell in each hand directly under your shoulders. Row one dumbbell up into your body until it touches your ribs. 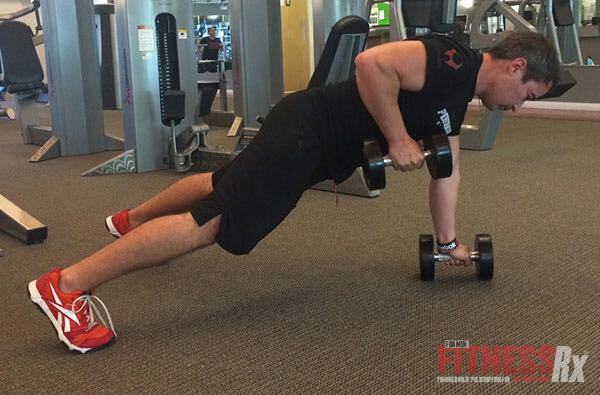 Slowly lower the dumbbell to the floor and row the other dumbbell in the same manner. Be sure that your torso remains as stable as possible and you do not allow your hips to rotate at any time. Stand with your feet slightly wider than shoulder-width apart and perpendicular to a cable column that is on one side, holding the handle with both hands— the handle should be attached to the lowest position. Squat down while simultaneously shifting most of your weight to the leg closest to the column while your arms are at a downward angle reaching toward the origin of the cable. Stand up while simultaneously shifting your weight toward the other leg as you also drive the cable at a diagonally upward angle across your body. Finish at the top with your arms above your head on your side. Reverse the motion to the starting position and repeat. Be sure to keep your spine in a neutral position throughout the exercise and to set your hips back at the bottom position. Your torso should remain fairly perpendicular to the cable column. Do not rotate your torso away from the cable column as you reach the top of the range of motion of the exercise. Doing so greatly reduces the tension on your torso muscles. Perform this exercise both eccentrically and concentrically in a smooth and coordinated fashion. 1. Dominguez, R, and Gadja, R. Total Body Training. New York, NY: Charles Scribner’s Sons; 7-12, 1982. 2. Integration core exercises elicit greater muscle activation than isolation exercises. Gottschall JS, Mills J, Hastings B. J Strength Cond Res. 2013 Mar;27(3):590-6. 3. Nuzzo JL, et al. Trunk muscle activity during stability ball and free weight exercises. J Strength Cond Res. 2008 Jan;22(1):95-102. 4. Martuscello JM, et al. Systematic review of core muscle activity during physical fitness exercises. J Strength Cond Res. 2013 Jun;27(6):1684-98.